AMES, Iowa – To put it simply, Beth Reynolds sees herself as a resource for producers. 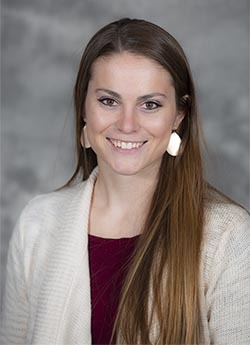 As the new extension program specialist with the Iowa Beef Center, she said her goal is to provide relevant materials and keep resources readily available. For example, Reynolds said her primary interest is in the cow-calf sector and forage utilization. However, as a Colorado native who grew up on a diversified family farming operation that uses cover crops and corn residue for their commercial cow and registered Charolais herd, she knows she’ll need to shift her focus somewhat. Reynolds earned a B.S. in animal science with production focus from University of Wyoming in Laramie, and received her M.S. in animal science with focus on ruminant nutrition from University of Nebraska—Lincoln. Her thesis work centered on evaluating the risk of nitrate toxicity when grazing annual forages and determining how that risk might differ from feeding hayed annual forages. She also was involved with a research project that evaluated how the nutritive quality of oats, turnips and radishes changes when those crops are grazed from late October to January in south central Nebraska. She said it’s important for producers to understand how to communicate with consumers about management decisions while keeping science at the forefront of the conversations. Reynolds said producers should look forward to seeing her at meetings, field days and research projects. She looks forward to working with her IBC colleagues to share information and opportunities for education with producers and others in the beef industry.